While my daughters are affected by television commercials just as much as other kids, they do tend to quickly lose interest in just about everything they see on the screen (which I appreciate). Mommy, that baby has her own bathtub! Did you see that, Mommy? You can REALLY wash her! (Stunned silence) Those purple spots really disappeared! Did you see? They're gone! And so on, etc. Each and every time the commercial aired. To be honest, I didn't pay too close of attention the first few times. But once I started to watch, I have to admit that I understood her excitement. My girls love baby dolls and they love bath time, so this was the perfect way to combine the two while engaging their maternal instinct. It seems, as usual, that Little Mommy has created just the right blend of imagination, entertainment and nurturing with their Little Mommy Bubbly Bathtime doll. Specially designed for little girls as young as 18 months, Little Mommy provides products that offer play for all ages and all stages of a little girl's life. From infant and newborn traditional doll options to fully interactive babies and toddlers that can walk, cry, crawl, eat, sneeze, play peek-a-boo, go potty and much more, there is sure to be a doll for every young girl. Even better, these dolls are are available in different ethnicities so that little girls everywhere are able to play with and love a baby that resembles themselves. What a great way for a little mommy to feel an even closer bond! Therefore, when a Little Mommy Bubbly Bathtime doll arrived, I had no doubt that both of my daughters would be overjoyed to participate in giving her a good scrub-a-dub-dub after a long day of play. Right out of the package, we admired the small details and cute additions that had gone into making this doll unique and special. Containing the baby herself, her bird towel/robe, diaper, bathtub, soap pump dispenser, bird-shaped pouring cup and instructions, it took less than two minutes before Little Sister B and I had the bath prepared and ready to go. After filling the bathtub with warm water, I followed Little Mommy's suggestion to fill the soap dispenser with bubble bath, and hooked it easily onto the side of the tub. All that was left to do was cover a section of the table with a towel and Little Sister B was ready to clean her baby up from head to toe. ...as well as her constant amazement at the way that the purple "dirty" marks on her baby disappeared as she washed them. Magic! The color change spots return as soon as the baby has cooled back to room temperature (which is pretty quickly), so while I think that Little Sister B would prefer that her baby could stay "clean" a little bit longer, it just means that she can wash, re-wash and re-wash again and again! Giving the ability to truly emulate Mommy, this Bubbly Bathtime doll, her cute pink tub, and her working foam dispenser all come together for a great deal of bubbly bath fun. Both of my girls have had a great time using the bird-shaped pouring cup to rinse this baby clean, as well as have brought her right into the real bathtub with them at times to let her get in a bit of a swim while scrubbing her up as well. Whether in or out of the water, there is something about a doll that allows a girl to realistically mimic the nurturing role of being mom, celebrating everything from major milestones to giggly everyday moments. Little Mommy has easily captured that innocence and fun with Bubbly Bathtime and I love the way that this doll helps express and encourage fun as well as responsibility. Available in store or online at Amazon.com, Target.com, ToysRUs.com and more for $21.99, this doll comes in Caucasian and African-American versions and is sure to bring a great deal of creative, imaginative wholesome fun for ages 2 and up. One lucky person will win a Little Mommy Bubbly Bathtime Doll! A big thank you to Little Mommy for providing a Bubbly Bathtime doll for me to review as well as one for one lucky giveaway winner. The opinions shared are my own and honest and if you really need to see more, click here to see how I roll. My kids love to play in the bubbles! My son loves to play with his rubber ducky in the bath, his Legos and cars out of the bath, and be "daddy" to his stuffed animals. He's a very well-rounded little boy! My kids love bubbles and splashing in the water. My kids love splashing in the water. They love to play with the bubbles and the rubber duckie. My kids love the bubbles lots and lots of them! My daughter loves to sing in the bathtub! She loves her bath time. One of her favorite things is to fill up a cup of water and dump it on herself. That they get to play in the water for awhile. My son loves playing with his toys in the tub. My granddaughters love making a mess and lots of bubbles in the tub. But they came out smelling just as swet as always and the floor is easily cleaned up..
My granddaughter's favorite thing about bathtime is the bubbles we put in there!! We have so much fun!~! My daughter loves the bath paints, she always has fun with that. He loves to try to splash me. my daughter loves to draw in the tub, I buy the washable tub crayones and markers! Playing her ipod in the shower. My daughter has some Spongebob Squarepants bath toys that she loves to play with in the bath. Playing with their toys and bubbles! I turn the CD player on, and we all jam to the tunes while they are taking their baths!!! When my kids were little, they loved bath time. Well, gee, my daughter is an adult, but I am entering to donate this item to a childrens charity. My daughter likes squeezing the water out of the squeeze toys. Just splashing everything and everyone. My granddaughter loves the water! My daughter's favorite part of bath time is the bubbles! Splashing and playing in the bubbles is my daughters favorite! My little one loves to pour water from container to container to container! My granddaughter likes to pour the water all over herself. My grandkids have more toys than water in the tub. Lots of fun! My youngest is 3, but she is very tiny. She likes to float and pretend to swim. My daughter likes to pretend that she's a mermaid and submerge herself except her face in the water. Their favorite thing about bath time is their fun bath toys especially the wind up turtle! My grandkids love there bath toys and I love that bed time is after bath time. Loves to splash and play with the bath toys. My daughter likes playing with the bath toys and bubbles. Playing with toys and bubbles! MY daughter loves pouring water from cup to cup in the bathtub.She loves bathtime! When my daughter was younger hers was the "swimming" she loved swimming in the bath. My son just loves to splash. My daughter's favorite thing about bath time is bath toys and bubble bath. Splashing around in the water and playing with her toys. 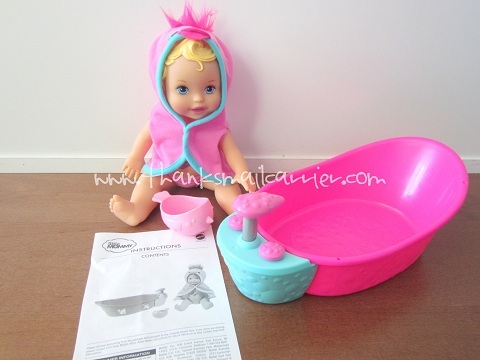 My kids love splashing and playing with the toys that are for bath only. My daughter's favorite thing is playing in the bubbles. My son is currently obsessed with Elmo Water Color Changing Tablets. He chooses a new color to make his bath every night. Thanks so much for the fantastic giveaway! Oh wow, she LOVES bathtime. I think she just likes the water period lol She likes to play with her toys in the tub and write with bath crayons on the walls lol I think she likes that the best, but she'll have to learn not to use real crayons on the walls haha. My daughter likes playing with her bath toys that float; she usually pretends she's a pirate or doing some kind of sea adventure thing. Bubbles, bubbles and more bubbles. She loves bubbles. My daughter loves playing with her toy story boat in the bathtub! Playing with toys in the water! My kids love to SPLASH! The kids like the water toys and bubbles. They love to splash and make a mess. Playing with all of her tub toys and splashing. Playing in the bubbles and splashing. she's not happy unless I'm as wet as she is. she loves her bath squirters! She loves her bath toys! Splashing around in the water! My daughter loves to color in the tub! My daughter absolutely loves having a cup in the bathrub and she'll just fill it up and pour the water over herself over and over! the grandkids love bubbles and splashing around with their toys! My daughter loves playing with her toys and drawing with her bath crayons. My granddaughter loves pretending she is a mermaid. They like singing in the tub. My daughter loves washing her dolls hair and my son loves to sink his boats! Carlees favorite thing about baths is bubbles!!! My granddaughter Nellie is only 9 months old and she loves to splash. splashing about in the water is just plain fun! My children enjoy being able to pick a toy to bring in the tubby with them. Thanks for the chance. My niece loves splashing around in the water! Princess G loves getting a bath and our fav thing to do while she is bathing is sing...yes, sing! Bubbles are my daughter's favorite thing! My daughters favorite thing is to play with her Mermaid Barbies in the bath. Her favorite thing is playing with her bath toys! she just loves the water!! My daughter has sensory processing disorder and her too favorite things are to play in the water and with her baby dolls. She plays "mommy" for hours each day! This would be perfect for her!!!! My son loves playing at bath time with my niece. They throw bubbles at each other and it is so much fun. My kids love any time we make it a bubble bath! It never gets old. Playing with the bathtub crayons are their favorite thing! My 7 year old daughter loves to have a tea party at bath time. One rule - don't drink the bath water. My kids love to play in the bubbles with all of the bath toys they accumulate. Pouring watt from cup to cup! Acting out water adventures with the bath toys. My little great-niece loves to take bubble baths! She LOVES playing with her mermaid set and water works station. This would be perfect! Thanks for the giveaway. She loves bringing her barbies or babies in with her and giving them baths! BUBBLES, Bubbles & More Bubbles!!! Her favorite thing is her bubble maker. My son loves playing with bubbles and collecting them in little cups. Bubble bath is my daughters favorite thing about bath time! She loves splashing in the water and she loves when I rinse her hair. My granddaugher's favorite thing about bathtime is that she can "swim" around like a fish & get to play with her special "bath" toys. My daughter loves to swim like a fish in the tub! Playing with the tub toys! playing with the bubble on the bubble bath water! My kids love putting in as many toys as possible in the bathtub with them. My kids like playing with toys in the tub! My grandaughter likes to swim in the tub pretending shes a mermaid! Mostly splashing around and having fun with the bubbles. My granddaughter and grandson love playing in the bath and also they both love bubble baths! My niece likes to play with every toy she has in the tub until she turns into a prune. She also like that paint you use in the tub. My daughter loves to play with her mermaid toys.